Hi there. 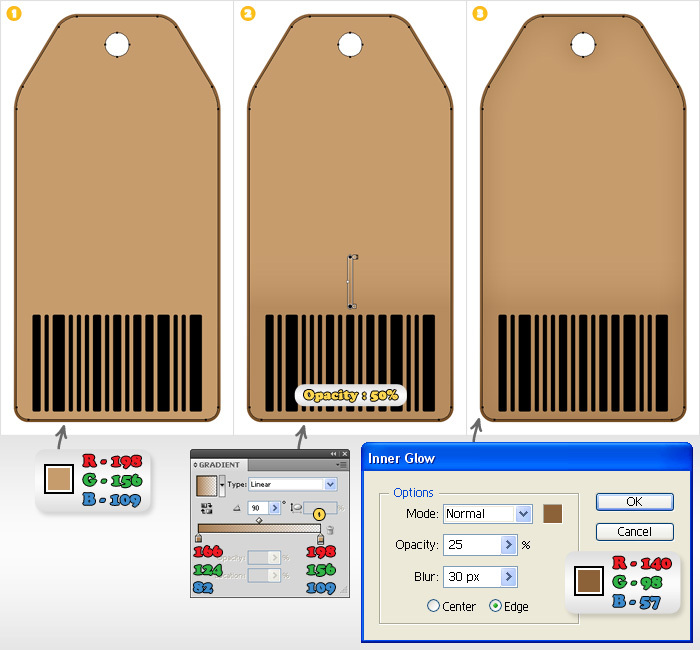 In the following tutorial I will show you how to create a neat price tag. First, for the basic shape, the grid and the Snap to Grid will significantly ease your work. Then, for the rest of the illustration you’ll use the Pathfinder options, multiple gradients and strokes plus some basic effects and brushes. 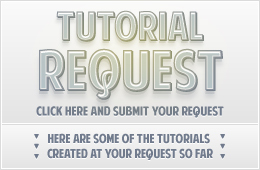 Create a 700 by 700px document. 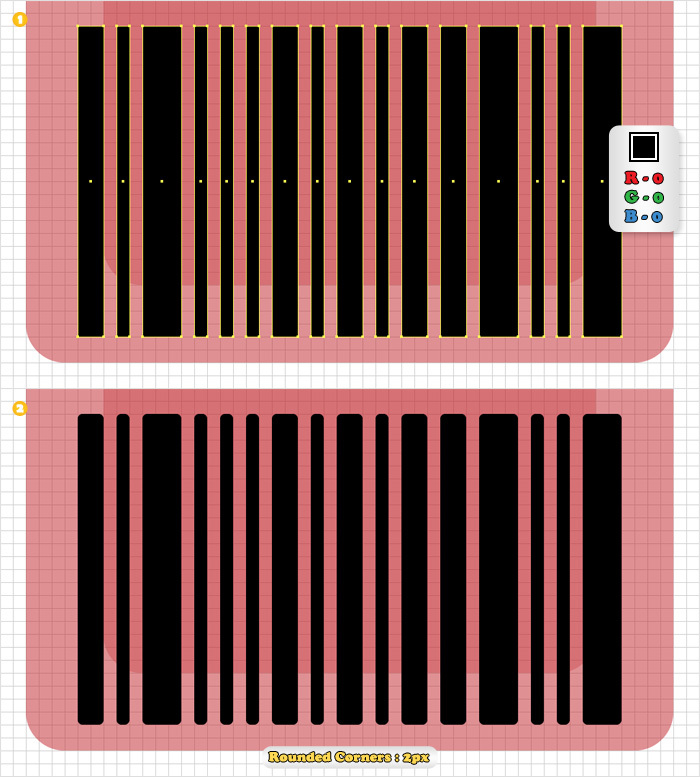 First, turn on the Grid (View > Grid) and the Snap to Grid (View > Snap to Grid). Next, you’ll need a grid every 10px. Go to Edit > Preferences > Guides & Grid, enter “10” in the “Gridline every :” box and “1” in the “Subdivisions” box. You should also open the Info panel to increase your work speed. 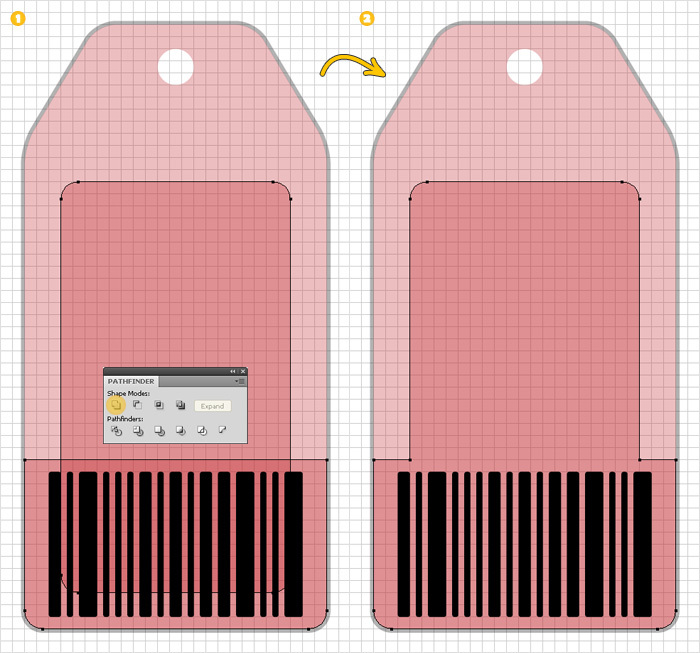 This way, you can easily see the values for width and height for any shape. 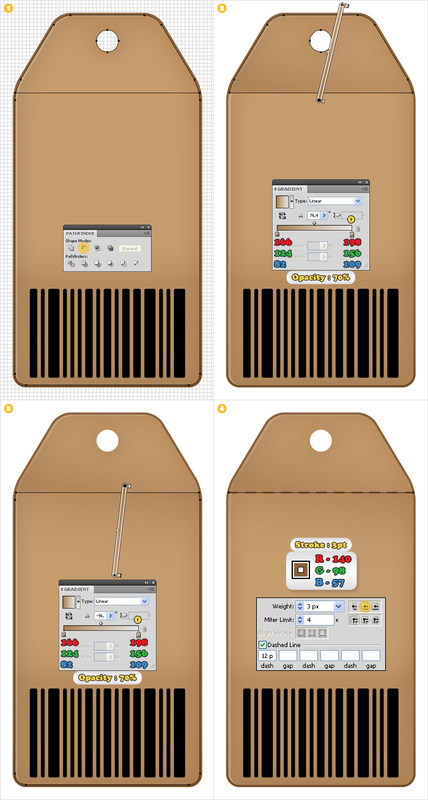 Now, select the Rectangle Tool(M) and create a 250x500px shape. Pick the Add Anchor Point Tool(+) and add two new anchor points in the points highlighted with green (image #2). 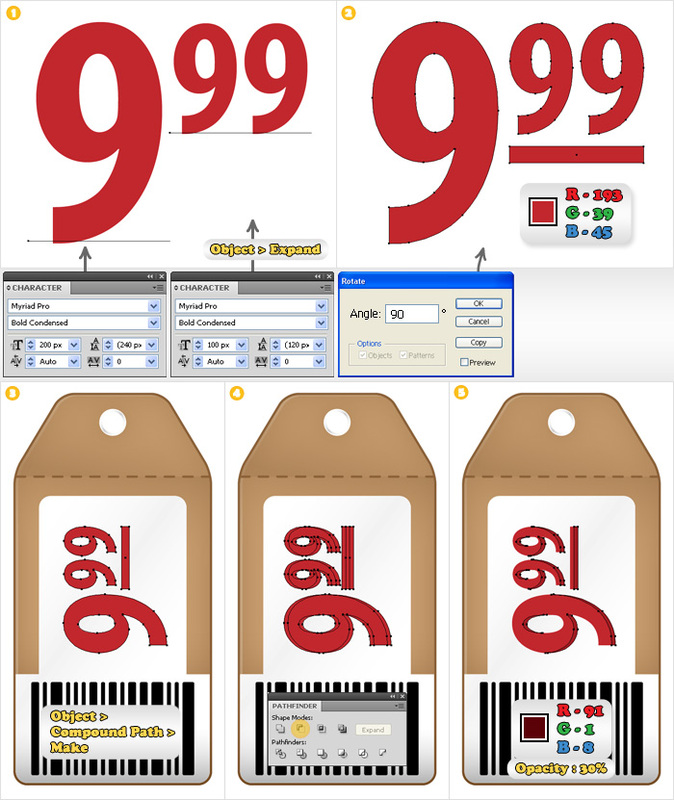 Grab the Direct Selection Tool(A), select the top, left anchor point and move it 60px to the right. 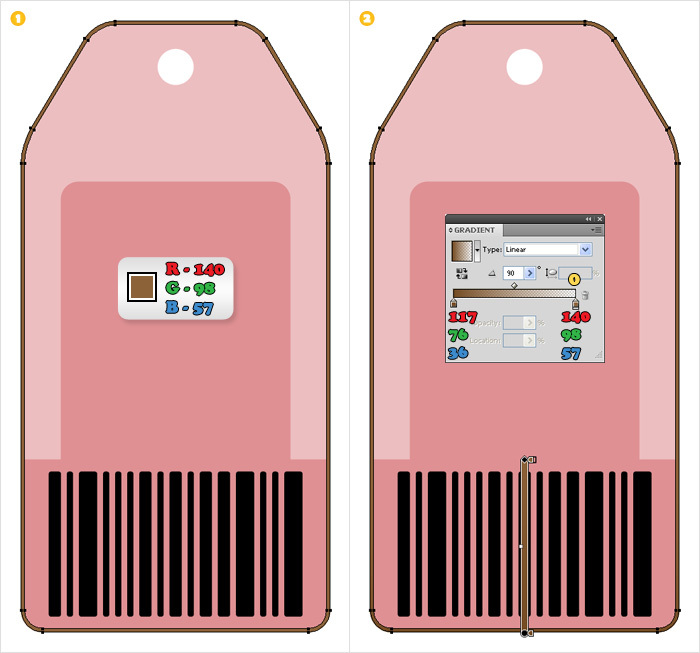 Next, select the top, right anchor point and move it 60px to the left. Select the resulting shape, add a 15px Rounded Corners effect (Effect > Stylize > Rounded Corners) and go to Object > Expand Appearance. 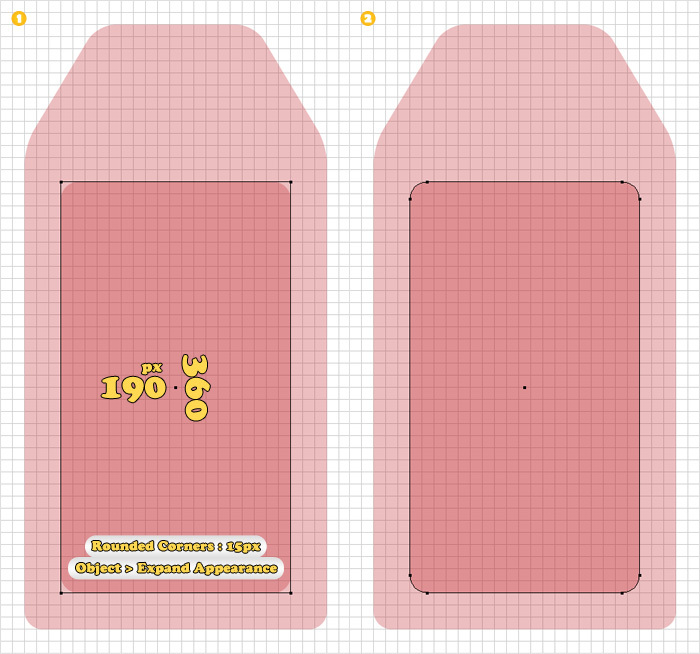 Select the Rectangle Tool(M), create a 190x360px shape and place it as shown in image #1. 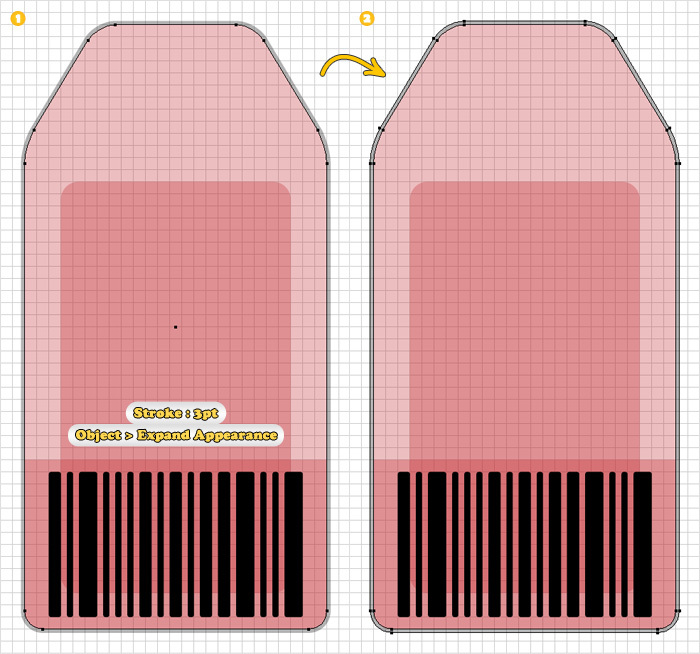 Add a 15px Rounded Corners effect then go to Object > Expand Appearance. Duplicate the shapes made in step #1. 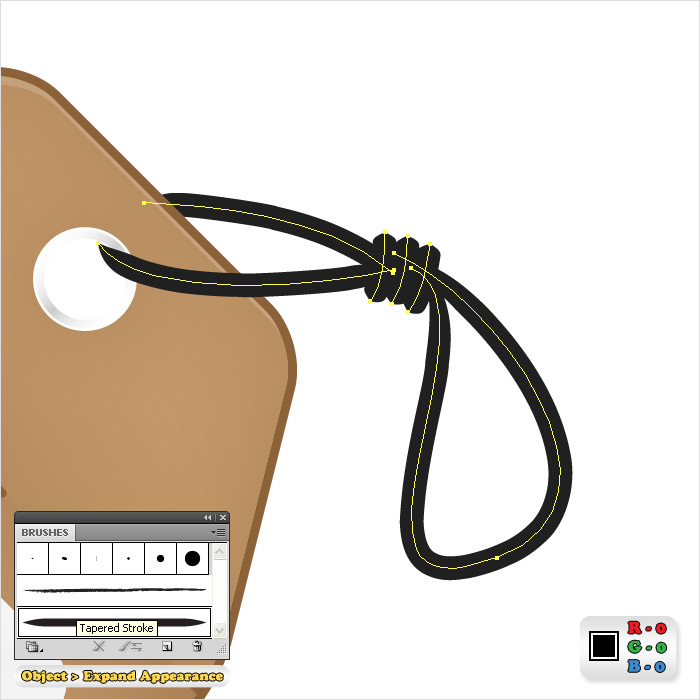 Once again, select the Rectangle Tool and create a shape like the one shown in image #1. 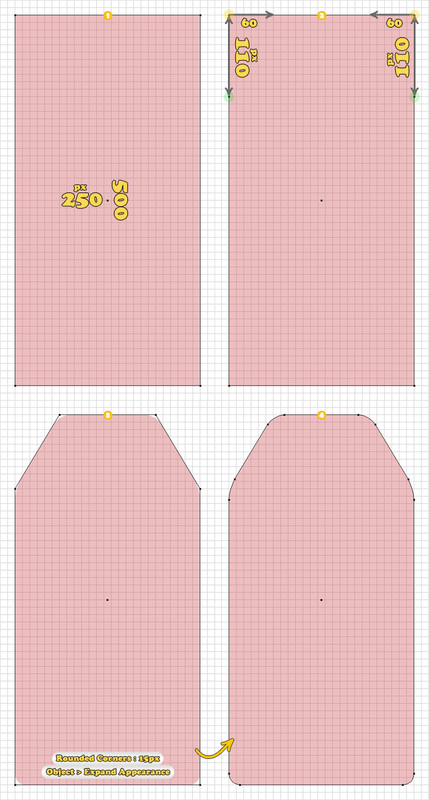 Select this new shape along with the fresh copy and click on the Intersect button from the Pathfinder panel. Now, you need to create a simple code bar. You’ll need a grid every 5px. Go to Edit > Preferences > Guides & Grid and enter “5” in the “Gridline every :” box. Select the Rectangle Tool(M) and create the group of shapes shown in the following image. 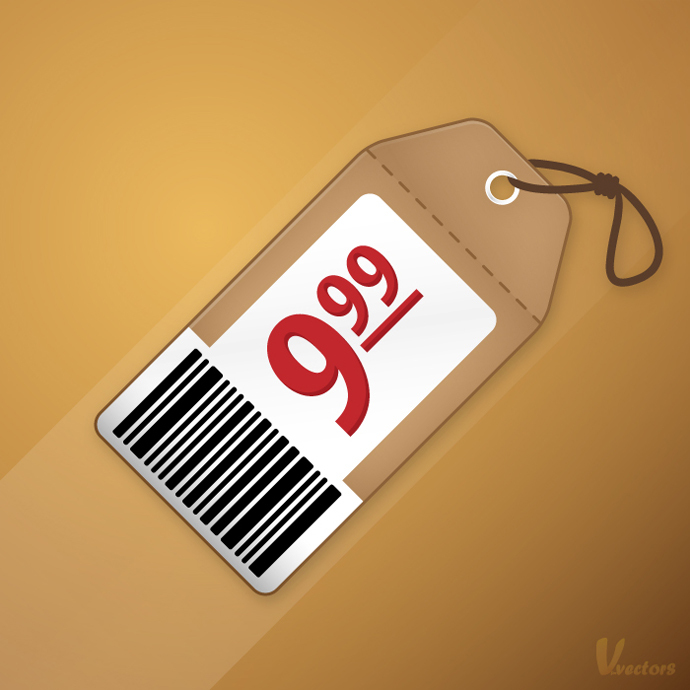 Fill them all with black then add a 2px Rounded Corners effect. Duplicate the shape made in the first step. Select this copy, fill it with none, add a 3pt aligned to outside stroke then go to Object > Expand Appearance. Name this new shape “1”. Go back to Edit > Preferences > Guides & Grid and enter “10” in the “Gridline every :” box. Select the Ellipse Tool, create a 30x30px shape and place it as shown in image #1. Create a copy of this shape, name it “vvv” and make it invisible. You’ll need it later. 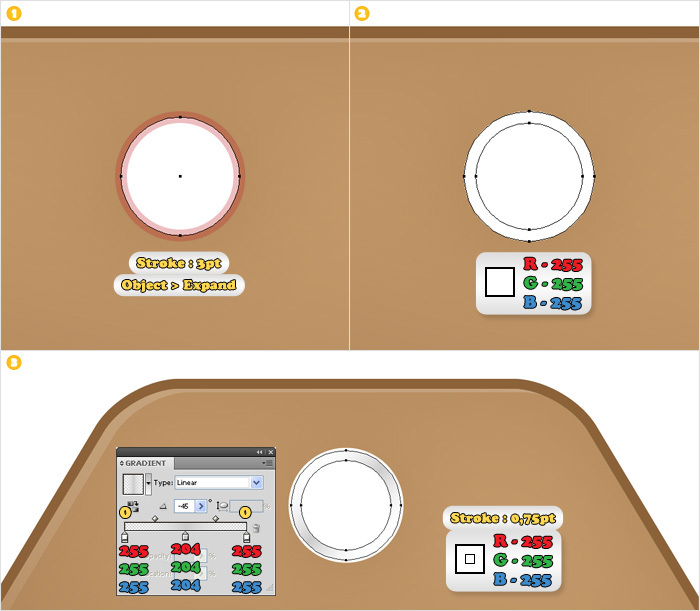 Select the original circle and the shape made in step #1 and click on the Minus Front button from the Pathfinder panel. Name the resulting shape “2”. Select the shapes made in steps #2 and #3 and click on the Unite button from the Pathfinder panel. Name the resulting shape “3”. Select shape “1” and fill it with R=140 G=98 B=57. 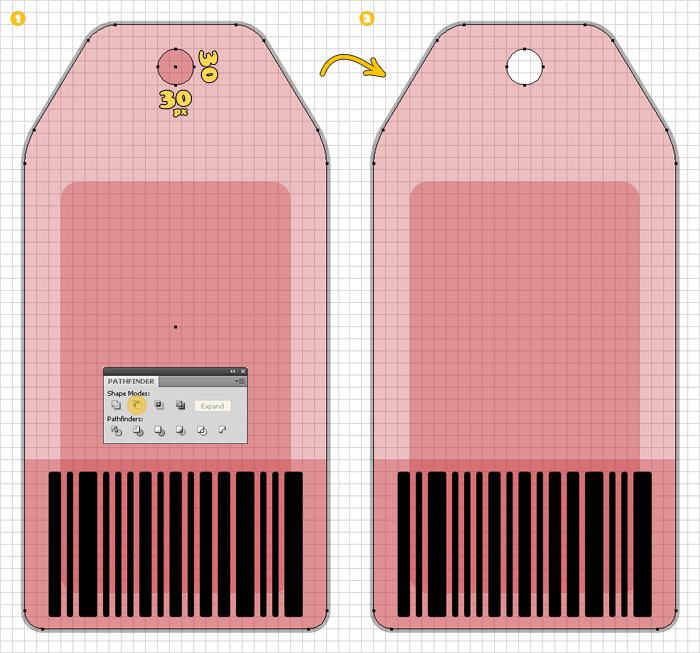 Add a new fill for this shape (from the flyout menu of the Appearance panel) and use the gradient shown in image #2. Select shape “2” and fill it with R=198 G=156 B=109. Add a new fill for this shape lower its opacity to 50% then use the gradient shown below image #2. Finally, reselect the entire shape and add the Inner Glow effect. Turn off the Snap to Grid. Make two copies of “2”. 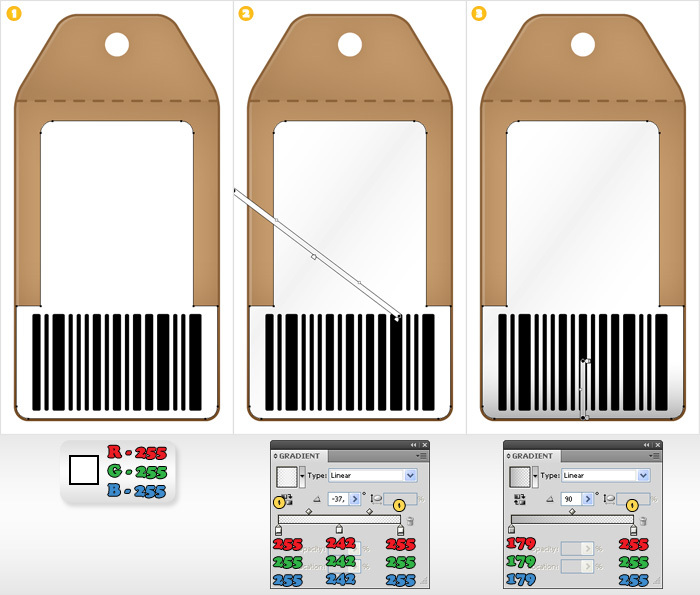 Select the top one and move it 1px down and 3px to the right. Reselect both copies and click on the Minus Front button from the Pathfinder panel. Keep the long shape and delete the other one. Fill it with white and lower its opacity to 20%. Turn on the Snap to Grid then go to Edit > Preferences > Guides & Grid and enter “5” in the “Gridline every :” box. Now, select the Pen Tool(P) and draw a horizontal path like in image #1. The Snap to Grid will ease your work. Duplicate this path and shape “1”. Select these two copies then click on the Divide button from the Pathfinder panel. You should get two new shapes. Select the top one, fill it with the linear gradient shown in image #2 and lower its opacity to 70%. Select the bottom shape, fill it with the linear gradient shown in image #3 and lower its opacity to 70%. Reselect the original horizontal path and Bring it to Front (Shift + Ctrl + ]). Fill it with none and add a 3px stroke (R=140 G=98 B=57). Next, you need to add a dotted effect for this stroke. Go to the Appearance panel and click on Stroke (the text). The Stroke panel should open. Click on the Round Cap button then check the Dashed Line box. Enter “12” in the first “Dash” box and you got it. Select shape “3” and fill it with white. 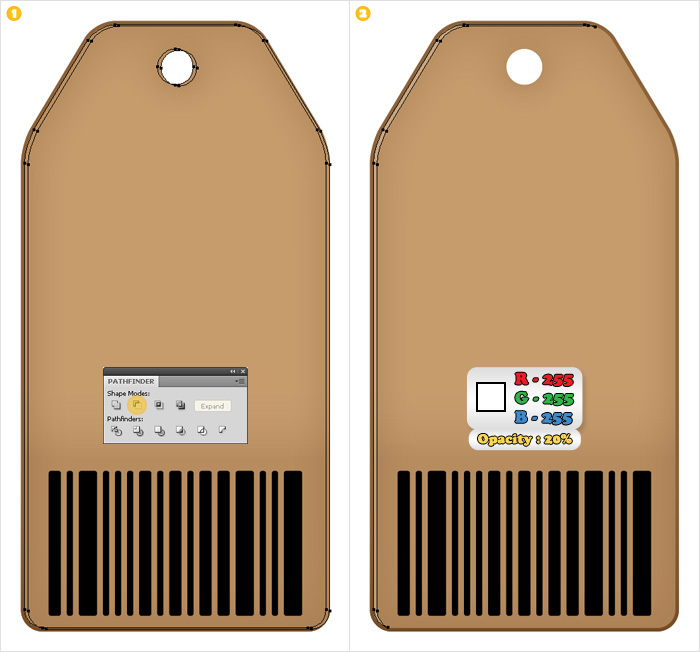 Add two new fills (from the flyout menu of the Appearance panel) and use the linear gradients shown below. Turn “vvv” back to visible. Bring it to Front (Shift + Ctrl + ]), fill it with none and add a 3px aligned to center stroke. Expand this stroke, fill it with white then add a 0,75px, white, aligned to outside stroke. Add a second fill for this shape and use the linear gradient shown in the final image. Now some text. 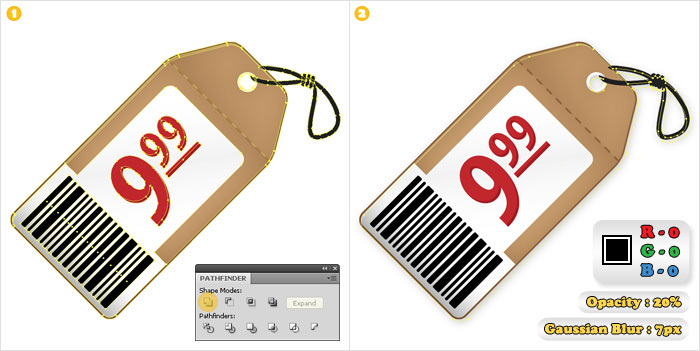 Select the Type Tool, add the text shown in the first image then go to Object > Expand. 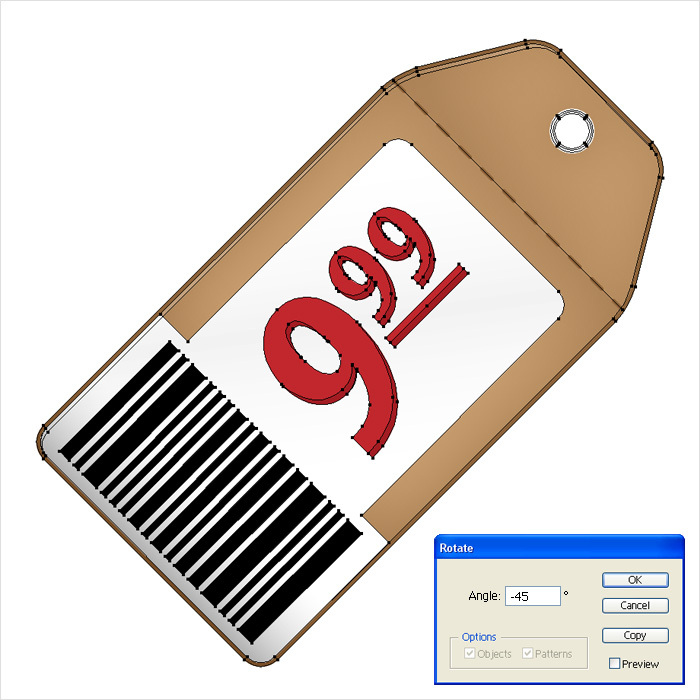 Select the Rectangle Tool(M) and create a thin rectangle below the smaller numbers. Fill all these shapes with R=193 G=39 B=45 then go to Object > Transform > Rotate. Enter a 90° Angle and click OK. Place these shape like in image #3 then go to Object > Compound Path > Make. 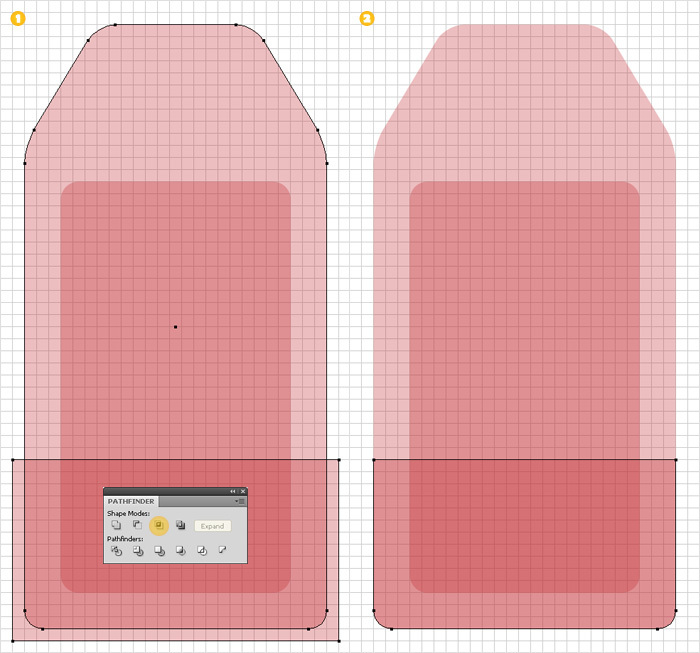 Create two copies of the resulting shape. Select the top copy and move it 5px to the left. Reselect both copies and click on the Minus Front button from the Pathfinder panel. 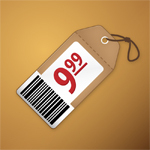 Select the resulting shapes, fill them with R=91 G=1 B=8 then lower their opacity to 30%. Select all the shapes and go to Object > Transform > Rotate. Enter a -45° Angle and click OK.
Open the Brushed panel (F5). Pick the Brush Tool then use the Tapered Stroke to create the simple, black paths shown below. Select all these paths and go to Object > Expand Appearance. Duplicate all the shapes made so far. Select all these copies and click on the Unite button from the Pathfinder panel. Select the resulting shape, fill it with black and send it to back (Shift + Ctrl + [). Move it 5px down and 3px to the right then add a 7px Gaussian Blur effect and lower its opacity to 20%. Now your work is done. Here is how it should look like. Good techniques, simple and easy – Lovely outcome. Really nice – thanks for such a useful tutorial! Thank you Marius, the result is great, very beautiful. Really nice! I like the color. Thanks for sharing friend it’s really professional. But i have all time a problem to apply the rounded corners effect and after the expand appearance. Not the same result. Help me en a video plz. Sorry, I don’t make videos. Do you always have this problem? What Illustration version do you have? Agree, i cant use Object > Expand Appearance as well. and i’m using CS5. Had the same problem and found a solution. you give the instruction very will that reader will understand.. This is an excellent tutorial! I love how mine turned out. Nice tut. Lots of work on your part – Thanks! that over again. Anyway, just wanted to say wonderful blog! Love ’em! And I prefer without vids so no worries on my part! The stroke align options are greyed out. Do you know why? Try clicking the Unite button from the Pathfinder panel and the stroke align options should be available. Let me know if it worked.